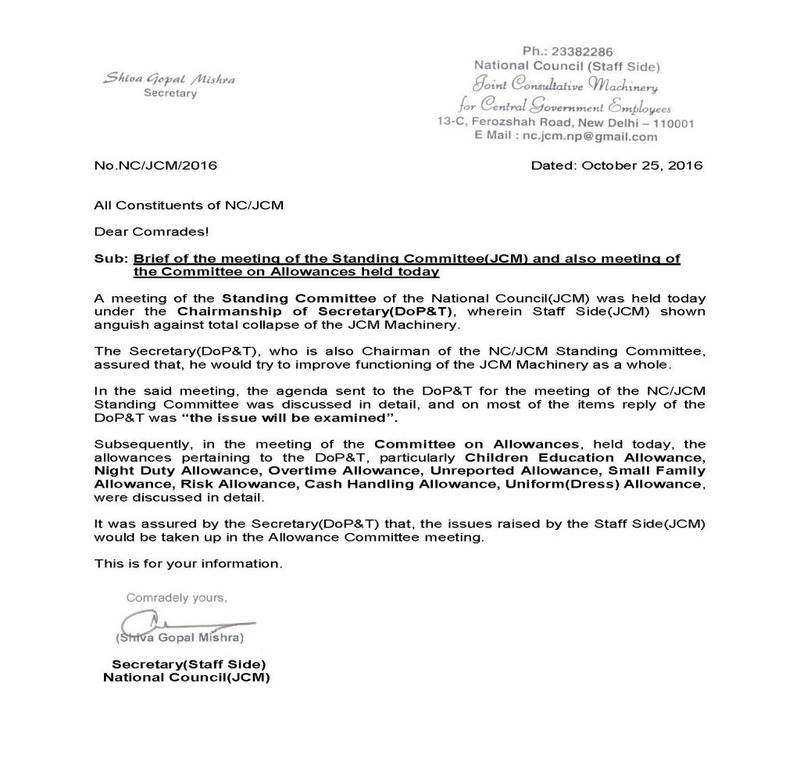 The Secretary, Staff Side National Council (JCM)requested Ministry of Finance to fix-up a meeting of the Committee on Allowances at an earliest to resolve the issues placed in the memorandum of the Staff Side (JCM) dated 16th September 2016 on various allowances. 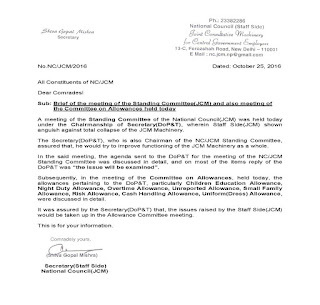 Shiv Gopal Mishra, Sceretary (Staff Side) NCJCM writes a letter to The Addl. Secretary (Exp.) 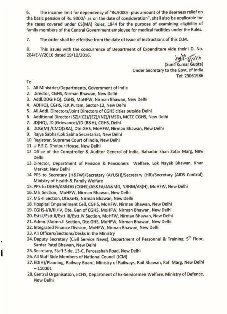 Department of Expenditure, Ministry of Finance, North Block, New Delhi requesting him to call a meeting with the Staff Side(JCM) to discuss and resolve the issue of Revision of Minimum Wage and Fitment Formula at the earliest vide NCJCM letter No. NC/JCM/2016 dated: December 29, 2016. Strike Notice - Confederation Served Strike Notice. The Confederation of Central Government Employees and Workers (CCGEW) has already taken up the matter of the delay with the Centre. Certificate of re-marriage/marriage – reg. AUTONOMOUS BODIES -- REVISION OF PAY AND PENSION --- LIKELY TO BE DELAYED --- GOVERNMENT ORDERED COMPLETE PERFORMANCE REVIEW AND RESTRUCTURING OF ALL AUTONOMOUS BODIES. 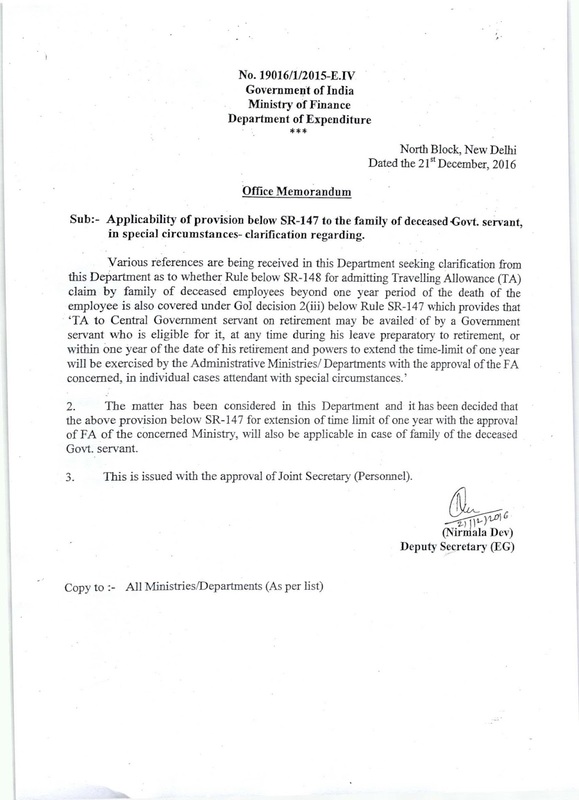 No.79016/1/2015-E.IV**Government of India**Ministry of Finance**Department of Expenditure***North Bloch New Delhi**Dated the 21st December, 2016**Oflice Memorandum**Sub:- Applicability of provision below SR-147 to the family of deceased Govt. servant, in special circumstances- clarification regarding. 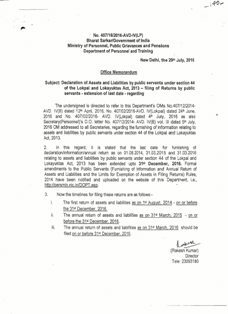 Delinking of revised pension from qualifying service of 33 years: More than 25 thousand cases are pending**F.No.CPAO/Co-ord/(107)/2016-17/542**Government Of India**Ministry Of finance, Department of Expenditure,**central Pension Accounting Office,**Trikoot-II, Bhikaji Cama Place, New Delhi – 110066**Phone:011-26178990 e-mail: sraocord-cpao@nic.in**dated 20th December 2016** OM No38/37/08-P&PW(A) dated 6th April 2016 of D&PW:Delinking of revised pension from qualifying service of 33 years. THE CAT IS OUT OF THE BAG. 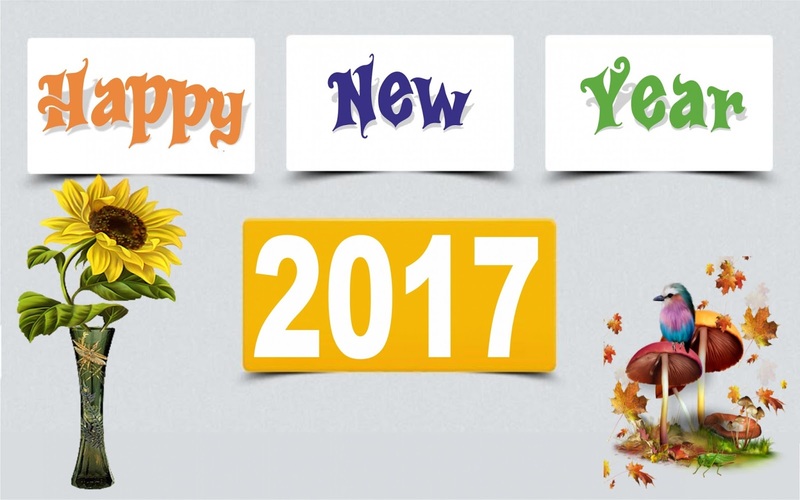 REV'S ED ALLOWANCES WILL NOT BE PAID IN THIS FINANCIAL YEAR – ALLOWANCES COMMITTEES TIME LIMIT EXTENDED UP TO 22.02.2017. 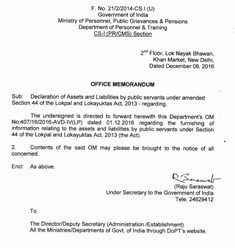 Declaratin of Assets and Liabilities by public servants under amended Section 44 of the Lokpal and Lokayuktas Act, 2013 – regarding. 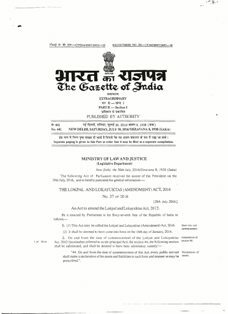 Lokpal and Lokayuktas Act, 2013 – regarding. 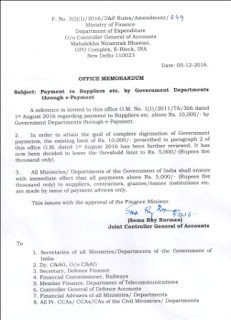 Payment to Suppliers etc. 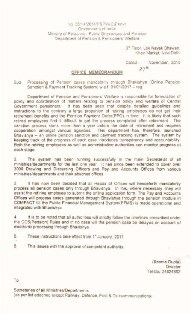 by Government Departments through e-Payment. 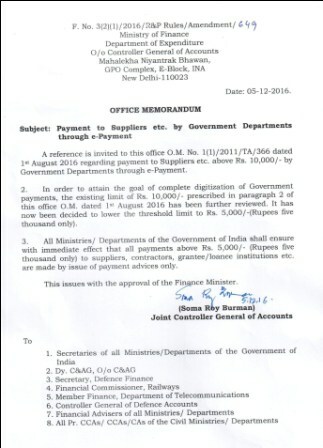 Salary advance for the month of November 2016 to be paid to Non-Gazetted employees of Central Government. 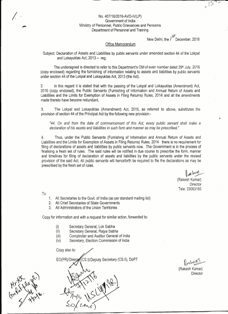 Request for issuing instructions for disbursement of salary of Central Government Employees for the month of November 2016 in cash. Parliament March on 15th Dec 2016 - Campaign and Mobilisation Programme. 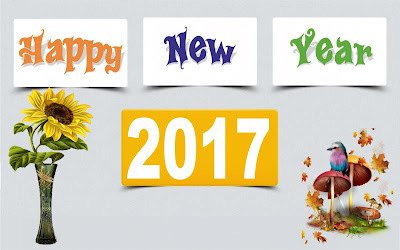 *Circular dated 2-11-2016* To 1) All National Secretariat Members (CHQ Office Bearers) 2) Chief Executives of all Affiliated organisations. 3) General Secretaries of all C-O-Cs. *15**th* * December 2016 Parliament March* ** Against the Breach of Assurance by the Group of Ministers. * ** Demanding settlement the 20 Point Charter of Demands. * *Campaign and Mobilisation Programme* *“We cannot be a party to any proposal, which may be considered as a surrender of the principled stand by the common workers”. Attention is invited to para. 2 of MoF O.M. of even No., dated 9-4-1979, as amended by O.M. 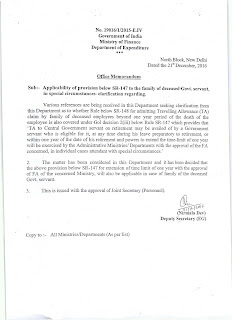 of even No., dated 3-5-1979, indicating the rates of total dearness allowance plus additional D.A. per mensem payable in the pay ranges of Rs. 1,031 and above. In para. 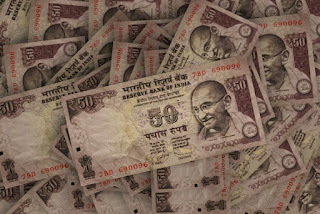 3 of the O.M., dated 9-4-1979, it was indicated that orders as to how much of these amounts would be treated as dearness allowance and how much as additional dearness allowance would be issued separately. 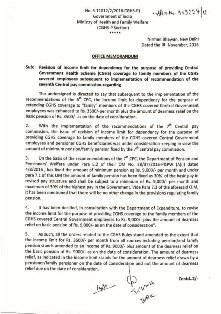 CLARIFICATIONS REGARDING FIXATION OF PAY AND GRANT OF INCREMENT IN THE REVISED PAY STRUCTURE. Interim Relief in addition to D.A.